Press Release: A Gold Coast artist’s own artistic gems to adorn the walls at Ruby. Christmas comes early for parents as the doors to our Junior Kids Club open! A Gold Coast artist’s own artistic gems to adorn the walls at Ruby. CEO of the Ruby Apartments David Brook wanted every aspect of Ruby to be unique and that included the artwork. “We wanted to work with a local artist who could create pieces that represented the fun, vibrancy and beauty of the Gold Coast. “We needed someone who also understood the needs of the tourism industry and someone who was as passionate about our brand as we were,” said David. “One of my colleagues met Tracie at an industry breakfast a few years ago and set up a meeting. I explained our brief, and after a few meetings, I knew it was the perfect partnership,” said David. “I’ve worked closely with David. He’s an incredibly creative thinker and together we’ve created amazing artworks that have been colour matched to the furnishings, fabrics and accessories. Each floor has a different colour tone and I’ve used a variety of painting techniques and mediums to create the original artworks,” said Tracie. With abstract design as a base, Tracie has incorporated texture, resin and fluid acrylic art, dry and wet brushing, foil leaf, pallet knifing. Upon opening in November each piece will be on display and offered for sale to ensure the décor at The Ruby Collection continues to stay fresh and unique each time a new guest comes to stay. 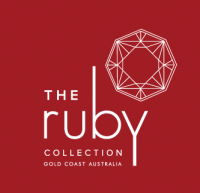 For more details on The Ruby Collection visit www.therubycollection.com.au.